In Texas, it's rare to attend a motorsport event that isn't something driving in circles around Texas Motor Speedway. We have a lot of tracks, but they're mostly club tracks or circuits too old to hold major motorsport events. All the more reason I was thrilled that LeMons was coming to practically my back yard! 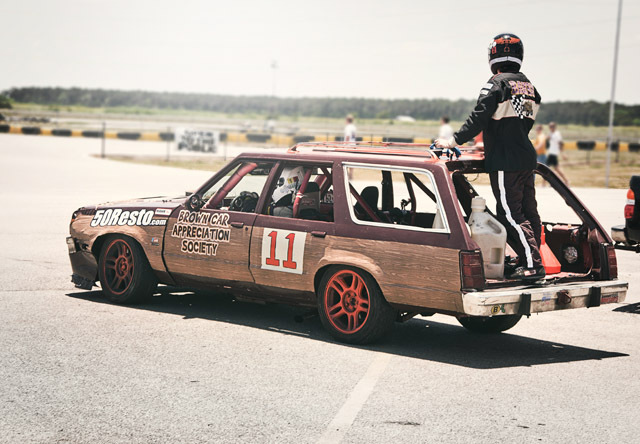 You know — LeMons — the race series comprised of $500 cars? Last weekend I attended the 24 of LeMons event in Angleton, Texas called the "Garrapatas Peligrosas GP." Although it's a cheap-car event, nice cars still show up. It was really hard to pull myself away from this fantastic Ford GT40 replica (wild guess). It's just incredibly photogenic. Cars are $500, and then on top of that there's safety equipment such as rollcage, seat, harness and stuff like that. You also have some leeway with wheels and tires, so the price tag gets up there. But still, obviously, monumentally cheaper than any other form of racing. All over the paddock during the race, cars were being worked on, repaired and occasionally swore at. Just as I made my way towards the Judge's station at the end of the paddock, there was some commotion. The "Team Miagra" Miata had apparently pranged into an olive drab Taurus SHO on track, and the two limped over for repairs and disciplinary action. My buddy Sajeev Mehta, yes, in the "Indian headdress," and a few other judges rushed around, scoping out the Taurus bodywork still clinging onto the MX-5. I'm not exactly sure what went on here. Despite the fun-loving, chaotic atmosphere, safety is taken very seriously. Fueling during pitstops happens in a very regulated manner, and the driver change happens after the gas cap is closed up. Some teams get way more into the showmanship than others. These are always the crowd favorite. I was impressed with the wing on this Thunderbird. A factory spoiler, raised 18" into the air — brilliant. This Miata (which was not a competitor car, don't worry) has the coolest license plate ever. Imagine a racing event where pretentious people are turned away at the gate. Lastly, more cool stuff from the parking lot. LeMons was one of the most fun racing events I've been to. The attitude, the spirit, the fun — it's unbeatable. Maybe for one of the next ones I can come back as a driver.